The girls playing with water in the garden. 7:30 Woke up after more than 8 hours of sleep. 8:30 My daughter woke up and we went downstairs. My husband was working upstairs. 10:00 Breakfast: Yogurt, banana, shredded coconut, cinnamon. Shortly after breakfast my daughter’s best friend came over with her mother and they both stayed for the day. It was warm and sunny so the girls played with water in the garden. 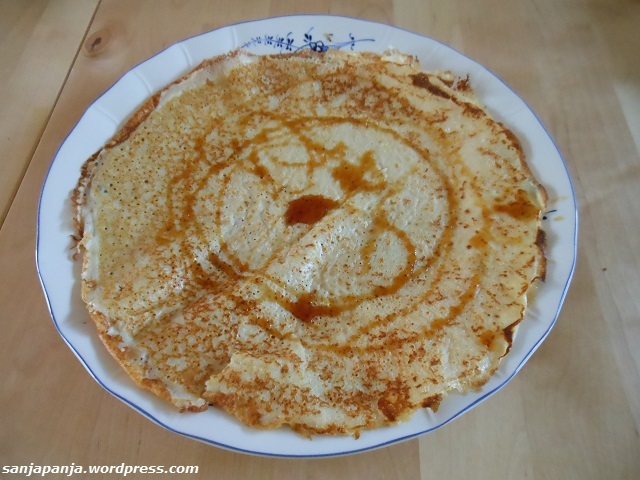 12:45 Lunch: Swedish pancakes (eggs, flour, milk, salt and butter). After our friends left we took our daughter to her swimming lesson. During the lesson me and my husband shared a snack: Grilled cheese sandwich with smoked salmon, cream cheese and a horseradish sauce. 19:10 Dinner: Cheese ravioli with broccoli, smoked salmon and Parmesan cheese. When our daughter went to sleep we had some tea. This entry was posted in food, life and tagged 8 hours of sleep, apple, banana, breakfast, broccoli, butter, cheese ravioli, cinnamon, coconut, cream cheese, daughter, daughter's best friend, dinner, egg, flour, food, friend, garden, grilled cheese sandwich, horseradish sauce, husband, milk, no school, parmesan cheese, playing, ravioli, salmon, salt, shredded coconut, smoked salmon, snack, Swedish pancakes, swimming lesson, tea, water, yoghurt, yogurt. Bookmark the permalink.